These impressive antique George V Britannia standard* silver peppers have a plain cylindrical form onto a circular spreading foot. The surface of each piece is plain and unembellished and encircled with a plain applied girdle. The peppers retain the original domed pierced decorated push fit hallmarked cover. These fine antique silver kitchen peppers are fitted with C scroll handles featuring plain thumbpieces. These impressive kitchen peppers have been crafted by Vander & Hedges of the renowned 20th century London silversmiths Tessiers Ltd.
*Britannia Silver - The Britannia silver standard of 958 (95.84% of fine silver), denoted by the icon of the seated Britannia holding an oval shield, was introduced by William III in 1697. This was to indicate the slightly higher standard of silver from sterling silver standard of 925 (92.5% of fine silver). 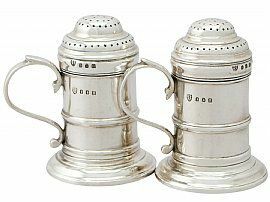 These antique kitchen peppers are an exceptional gauge of silver, fine quality and in excellent presentation condition. Full hallmarks struck to the surface and cover of each are all very clear.